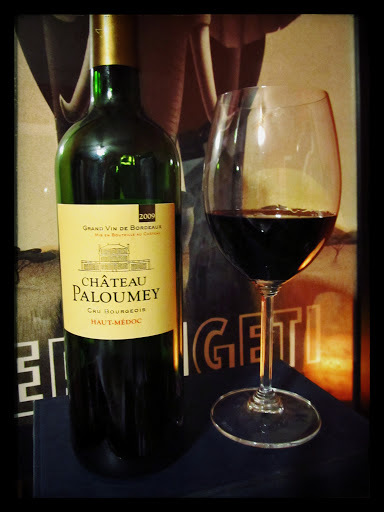 My husband is an immense fan of Bordeaux, so before going out to dinner to celebrate his birthday we snacked on a cheese plate including German brie with wild mushrooms and double cream gouda and gave a pre-celebratory pour to Château Paloumey Haut-Médoc Cru Bourgeois 2009.During the beginning of the 19th century Château Paloumey, located on the left bank of the Gironde River, produced wines highly regarded wines. [Paloumey is from a Gascon wood referring to the wood pigeon “palombe” which migrates over the vineyards in autumn.] The wars took their toll on the estate, by the 1950’s it lay abandoned and in ruin. In 1989 it was purchased by Martine Cazeneuve who set about restoring it to its 19th century glory. She was rewarded in 2003 when the estate was bestowed with a Crus Bourgeois Supérieur classification. Respecting “nature, terrior and the environment” is a priority, they employ many organic methods and strictly control the use [if any] of synthetic pesticides. Inky dark garnet in colour, after decanting aromas of black cherry, black currant and toasty oak rose from the glass. Black cherry, blackberry and black currant flavours were joined by traces of spiced vanilla and espresso in the medium to full body. Sweet cigar box spices, crushed black pepper and smoky cedar comprised the lengthy finish. Rich and velvety, this is a powerful yet refined glass that keeps you reaching for more.